Mama Shelter isn’t kidding about taking over the world. Multiple locations in France seemed like they’d always been part of the plan; a location in Los Angeles felt like a bold and slightly ambitious move. Mama Shelter Rio de Janeiro, however, was truly unexpected — now that it’s here, however, it feels as though it was always inevitable, and it just might be what this city always needed. After all, while there are plenty of options in Rio for the high-end luxury traveler, there’s a decided lack of provision for a younger, more adventurous audience. The hilltop haven of Santa Teresa is this crowd’s natural habitat, and it’s here, of course, that Mama Shelter calls home. If you’ve seen the other Mamas, then you know, at least to a certain degree, what to expect. The design is cheeky and urban-inspired, the atmosphere is convivial and social above all else, and comforts are more than adequate but stop well short of extravagant. It’s a localized version of the recipe, to be sure, with design flourishes that leave you with no doubt you’re in Brazil rather than France. In the end it strikes just the right balance. 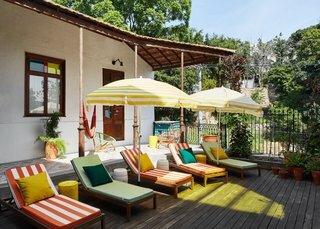 You’re in familiar (and stylish) hands, but you’re also unmistakably immersed in Santa Teresa’s daily life — and that, for a youth-oriented boutique hotel, is the name of the game.